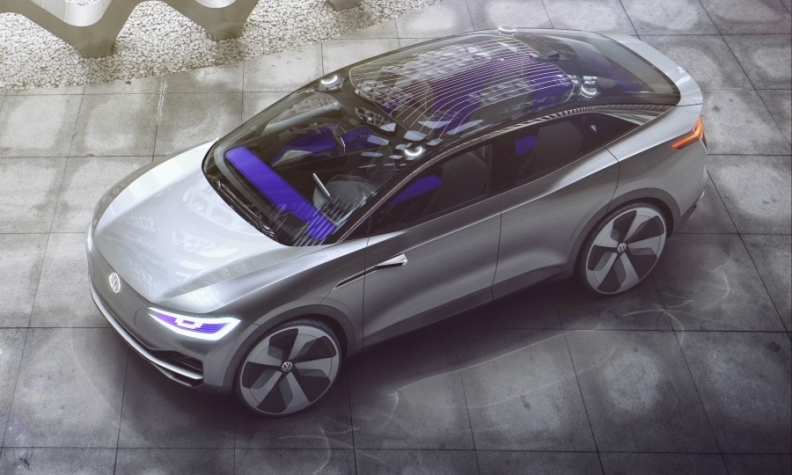 The production version of the ID Crozz concept, shown last month at the Shanghai auto show, will be a key EV for VW. WOLFSBURG -- Volkswagen brand is confident that it can become the global No. 1 seller of electric cars, leaving EV pioneer Tesla Motors in its rear-view mirror. VW brand chief Herbert Diess said he expects the brand will achieve its goal to sell 1 million battery driven vehicles annually by 2025. He also said is confident VW can accelerate past Tesla in the EV market because its new I.D. family of battery-powered cars will be able to do everything Tesla models can and "in some cases more." Diess believes the strength of its industry-leading joint ventures in China, the biggest market for electric cars, will give it the scale effects it needs to outcompete Tesla by offering mass-market battery powered vehicles at a lower price than the upcoming Model 3. Tesla, which sells the Model S sedan and Model X crossover, is moving into the mainstream market with the Model 3 compact sedan and CEO Elon Musk targets 1 million sales by 2020. "Naturally Tesla comes from a high price positioning originally, but it's moving downmarket and we have the clear goal with our new architecture to put a stop to Tesla," Diess said. "We will enter with models that are below even 30,000 euros or dollars, as well as some that certainly are positioned far higher, and clearly want to be market leader," Diess said at the brand's annual press conference on Friday. VW has now signed off on three battery electric models based on its new modular electric-vehicle architecture. The design, technical concept and and the sourcing of central components will be decided be the end of the year. The cars will come to market in 2020 and will be a Golf-sized hatchback and two SUVs, one the size of a Tiguan and the other the size of the Tiguan Allspace offering seven seats. The models will be the first members of the I.D. family. China is key to VW's electric plans. The VW brand dominates the passenger car volume market, the world's largest, through joint ventures with First Auto Works and SAIC Motor. The joint ventures built just over 3 million vehicles locally last year in 9 production plants. The ID Crozz SUV concept, shown last month at the Shanghai auto show, will be the core EV for China starting 2020. "China will be the leading market for electromobility in the coming years, so we will likely follow with local production roughly half to three quarters of a year later (following Germany)," Diess said. Tesla, which said the Model 3 will start at $35,000 before incentives, has no Chinese manufacturing partner, although China's tech giant Tencent recently boosted the company's political capital in the country by acquiring a 5 percent stake. Volkswagen Group China boss Jochem Heizmann said in March he estimates sales of plug-in hybrids and battery electric vehicles to grow at an average annual rate of 60 percent in the country over the four years through 2020, reaching a total of 2 million units. Five years later he expects that figure to hit 6 million. Volkswagen is not just the biggest player in terms of volumes. Its joint ventures are highly successful financially as well. Last year FAW-Volkswagen and SAIC-Volkswagen earned pretax margins of 13.6 percent and 17.6 percent, respectively, putting them on par with Porsche. This level of income means the joint ventures can afford to invest around 4 billion euros in their operations in 2017 with cash generated from their own businesses. "That's why we are very confident that we can stop Tesla's expansion in the volume market, since we are significantly better positioned and have a considerably higher capacity to achieve scale effects," Diess said. To ensure the vehicles remain affordable, VW will not follow the approach of BMW by using lightweight carbon-fiber reinforced plastic (CFRP) to reduce weight and lengthen range. "With electric cars you can recuperate most of the kinetic energy, so the performance and efficiency gains (of lightweight material) isn't as big as it is with combustion engine-powered cars," r&d chief Frank Welsch told reporters. "Since the necessity isn't so great, and CFRP remains expensive, we are leaving it."